Dear readers, I'm so excited to share my work on Netflix's GLOW with you! Set in the early 1980s in Los Angeles GLOW follows Ruth (Alison Brie) a struggling actress looking for her breakout role. She stumbles into a casting call for a female wrestling show filled with a ragtag group of actresses, hairdressers, models, stunt women and the lone real lady wrestler. We follow the group on their journey to become GLOW- Gorgeous Ladies of Wrestling. GLOW takes place in 1985 and working on period shows always presents some challenges. Vintage clothing is abundant in California and the 1980s aren't that far-gone. However, the birth of fast fashion and constantly developing fabric technology means often recent clothing was made quickly with sub-par materials. Elastic was a big problem—it deteriorated in the waistbands, vintage leotard edges and sock bands. I ripped apart so many skirts and leotards to overclock in new elastic to make them wearable. Active wear like leotards were worn to bits, so it was hard to find enough pieces in good shape to begin with. 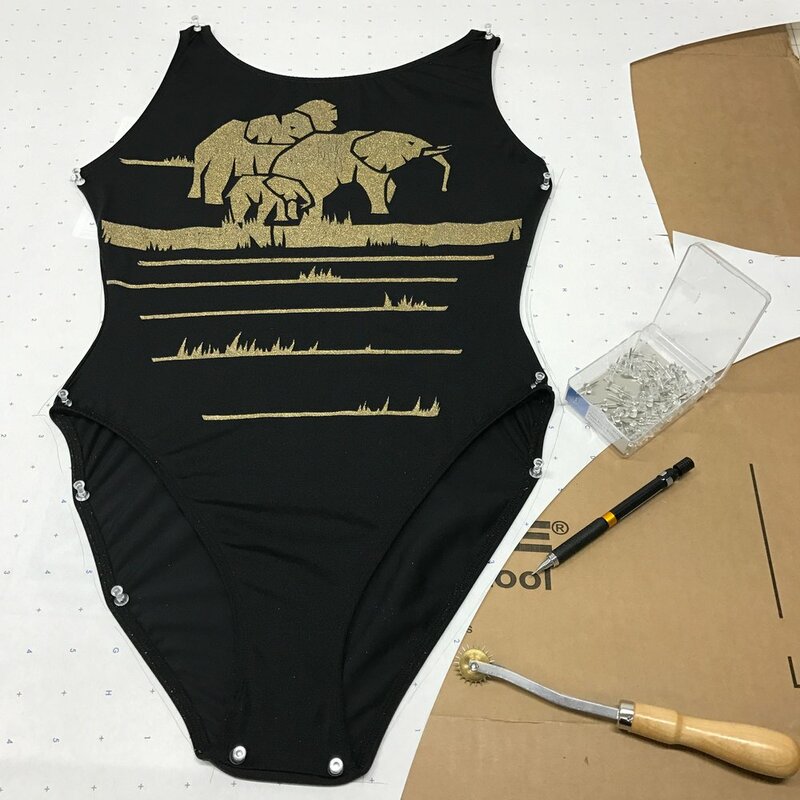 My main duty on GLOW was to make custom leotards. I made over sixty leotards in all shapes, sizes and colors. Costume designer Beth Morgan would send me inspiration photos, sketches and vintage pieces to replicate. I drafted a collection of basic leotard patterns from size extra small up to extra extra large and used these as my base. It's much easier to modify an existing pattern (often called a block) then to draft from scratch! Every time I made a new style or size I drew a technical flat. A flat is a simple drawing of the garment, showing style lines and silhouette. By the end of the season I had a whole wall of drawings that Beth could go to when designing a leotard, all she had to do was point, pick a fabric and off I went! This was especially handy when there was a leotard emergency and I needed to build one in just a few hours. We had a large collection of modern and period fabric to chose from for tight situations. Making women of many sizes and shapes feel comfortable in their leotards was a big responsibility. Most of the leotards are lined, making them feel a bit more study and thick enough to wear underwear and bras under - something not usually worn under dancewear. Some ladies liked a very high armhole and wide straps, others liked the leotards cut super high on the hip, or to have a deep plunge in the back. Cherry's jumpsuit from the pilot episode. Bash's rad Elvis costume from the house party in episode two. This was a rental that I had to repair and fit. Nothing to see here- just my big pregnant belly looming over the cutting table! Just one example of a custom fabric I created for a leotard. GLOW was such a fantastic show to work on. I was pregnant with my daughter and delivered just a week and a half after we wrapped, so that made everything just a bit more memorable. To be in the company of a mostly female cast and crew at such a pivotal moment in my life was really special. When I got close to my due date I brought in my friend Valerie Keiser to help me with the sewing and I couldn't have done it without her. I hope you enjoy the show and all the crazy leotards we made. Catch the whole season on Netflix. Comment below with your favorite look from season one! This April is the four-year anniversary of the Rana Plaza collapse. 1,129 women and men died when the massive sewing factory they worked in fell apart around them. Stitchers, pattern makers, cutters and fabric weavers—people who do work so similar to ours, but on the other side of the world for pennies. They had no benefits, workplace safety, coffee breaks or overtime pay. If you look in the mirror you are likely wearing somethingThis April is the four-year anniversary of the Rana Plaza collapse. 1,129 women and men died when the massive sewing factory they worked in fell apart around them. Stitchers, pattern makers, cutters and fabric weavers—people who do work so similar to ours, but on the other side of the world for pennies. They had no benefits, workplace safety, coffee breaks or overtime pay. If you look in the mirror you are likely wearing something sewn in similar conditions. I wrote this article shortly after the collapse for my union’s newsletter and now I’d like to share it with you. Some things have changed since, but not nearly enough. Check out links after the article for ideas to help. sewn in similar conditions. I wrote this article shortly after the collapse for my union’s newsletter and now I’d like to share it with you. Some things have changed since, but not nearly enough. Check out links after the article for ideas to help. Dear readers, if you follow me on Instagram you'll have noticed I’m having a studio built! Hammers are swinging, wood is being cut and paint buckets are scattered about. When the dust settles I’ll have a workshop behind my house with room for a cutting table, sewing machines, library and a little fitting nook. I worked with Tuff Shed to customize my studio and after everything was said and done it was delivered in a week and went up in two days! In the four years since joining the costumers union, I've met a lot of amazing ladies and gents. Sewists who have built costumes for the likes of Harrison Ford to Jennifer Lawrence. Set costumers who can tie a bowtie blindfolded. This week I’m sharing a chat I had with one such amazing set costumer, Valerie Campbell. I met Valerie while I was on set sewing alterations for re-shoots of the last Hunger Games movie and have worked with her several times since. When I saw that she was returning to Gilmore Girls for the Netflix miniseries I called her up for this interview. Dear readers I wish you could have been there! Not only did I get fun set stories, but some of Valerie's famous homemade iced cream and candies! Be sure to check out her Facebook page where she shares her recipes. Season two of Amazon’s Just Add Magic premiered this month and I'm delighted to finally share the sewing I did for the Halloween episode. Just Add Magic follows the adventures of three girls that find a magic cookbook, and by baking enchanted sweets solve mysteries in their small town. Jessica Lawson is the "Hollywood Seamstress," a costume maker living in Los Angeles, CA. She is a proud member of Local 705 Motion Picture Costumers Union and works on feature film, television, commercials, as well as building custom garments. She shares a home with her story board artist husband Max Lawson and their dog Lily. Jul 7, 2016 Who is the "Hollywood Seamstress" ?